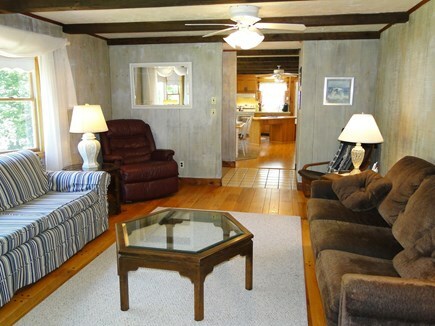 Master includes two bureaus and flat screen TV. King size master bedroom with walk in closet and master bath. Queen Bedroom with new mattress. Bunk beds with bottom drawer pull out mattress. This home is located in the Wild Harbour Estates, a private association neighborhood with its own private beach. The location could hardly be better in this upscale family neighborhood with a guarded entrance to ensure the beach remains private. Walk or drive to the beach. 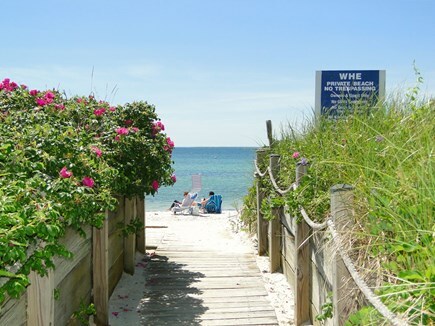 Upon arrival at the house you are given 2 guest passes that allows you to easily park at the beach and in and out of the neighborhood. We also leave a beach wagon for the kids. It is in close proximity to Old Silver Beach (approximately 1 mile). We also just updated our heating/central ac to top of the line equipment. 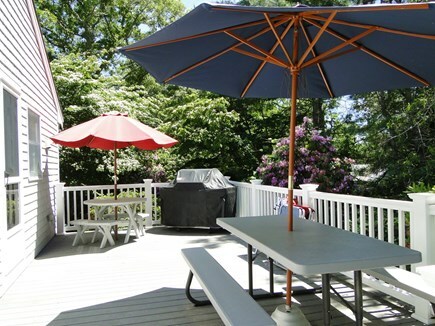 Enjoy a barbecue on the private back deck with a natural gas grill. 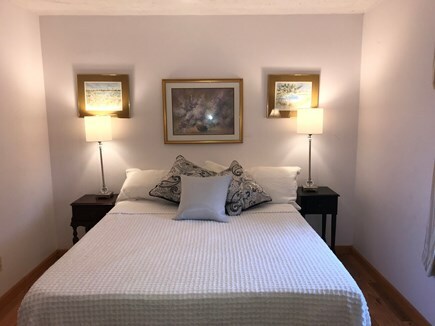 The Master bedroom has a King bed with a full master bath and a walk-in closet. The second bedroom has a new queen bed. We also leave a blow up twin cot for special accomodations. Off the kitchen is a small third bedroom (approx 10' x 10') bunk beds with a third bed in storage drawer below. 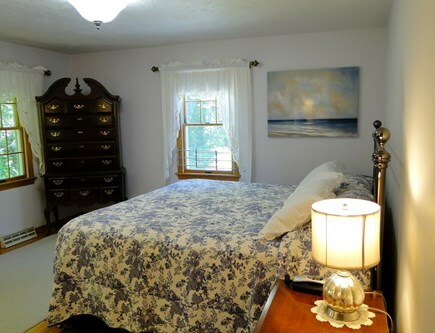 ( The living room is furnished with two couches, and one pulls out to a queen size bed. The kitchen has an island for additional seating and plenty of storage space. A booster seat and portacrib are available should you need them. We also leave beach chairs for your convenience. Additional pricing info: Reduced price for July 4th week, State and local taxes of 12.45% will apply. We had a wonderful week renting this lovely home. It had everything we wanted and was very comfortable. My daughter, 3 young grandsons and I just spent a delightful week on Cape Cod! The house was wonderful! It was everything that we expected. 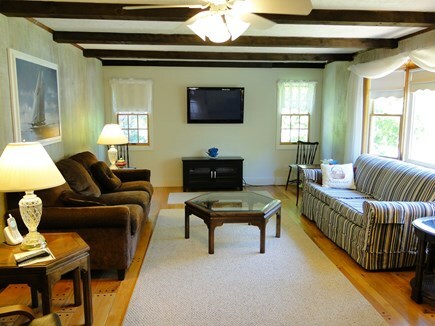 The description of the house, amenities and location were exact. The homeowner was lovely. She was so accommodating and wonderful to work with. 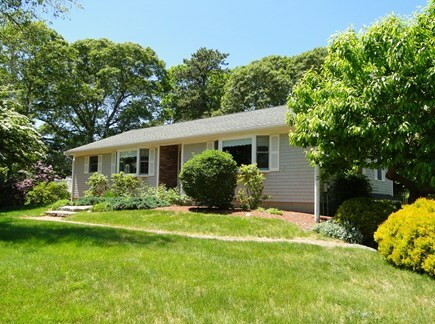 I highly recommend renting this beautiful Cape home! As soon as I entered this home I knew I made the very best choice of a rental in a gated community. The house has everything one needs for everyday living, cooking & cleaning. There was a minor problem, the owner was right on top of the matter and it was resolved very quickly. They are great people who are readily available if needed. You are close to the beach, shopping and restaurants. 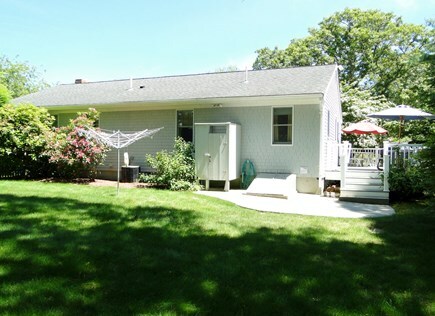 I would highly recommend this home to anyone looking for a beautiful stress free place to enjoy your stay at the Cape. 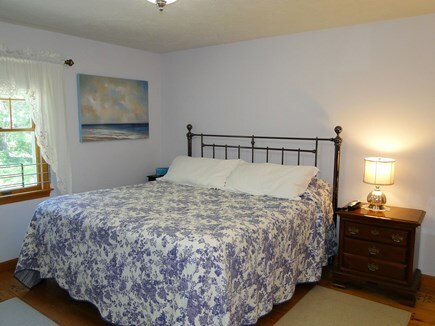 It s a beautifully landscaped beach community...5-minute walk to the beach. The house is very well equipped with pots, pans, silverware, towels, bed linens and an outdoor shower, which we loved!...especially after the beach! Large deck made for gathering with friends. At 6 am my husband went fly fishing down at the river that leads into the bay. 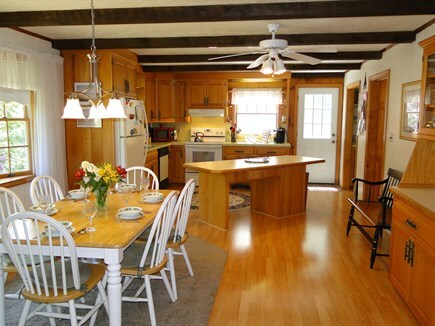 The house is very clean and the kitchen /dining room was our hub all week! Our two young granddaughters came for a visit and loved the bunk beds!! A wonderful vacation spot. House is neat and clean with geat location. Quiet yet close to the beautiful private beach. Deck and back yard are good for small children or adults to have a cold one after the beach. Two full baths makes life easier with kids. 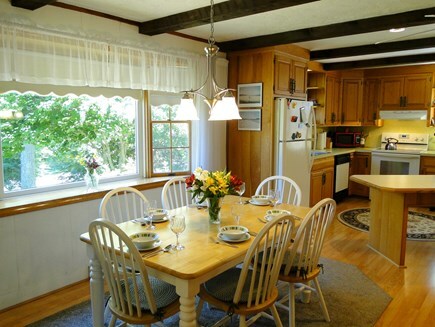 The open area kitchen and dining room make preparing meals simple and quick. We've been renting different places around Falmouth for the last five years, and finally decided to give N. Falmouth a try. This house is a gem--great location, excellent private beach, well maintained--and we really enjoyed our two weeks there. Sunsets at the beach were a regular event nearly every night. place to vacation. 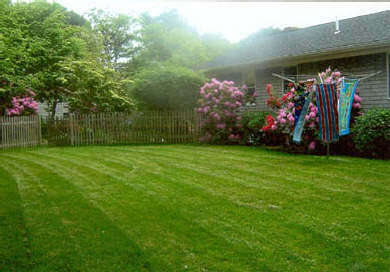 The house is very well kept and is always bright and clean. clean, and very well kept up. In fact, we enjoy seeing what has been done to it or added to it almost every year we go. 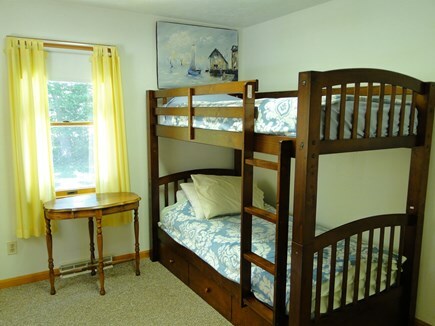 Also, the owners are generous in allowing the use of things like a child's beach wagon and beach chairs, and other children's items, which is not often the case with other rentals. And the owner always checks in at the end of the week to make sure everything has gone okay. 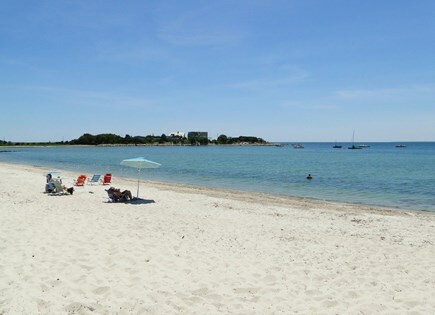 The back yard is great for kids to play in, the private beach is a plus, and if one prefers a change, it is a quick ride (about a mile) to Old Silver Beach.